This German meat fondue or fleischfondue is cooked in hot broth instead of hot oil, which is delicious and lower in fat, which many people prefer. Because broth boils at 212 F/100 C, the meat will take longer to cook, but that only enhances the party experience. Be sure to serve a green salad and some fresh bread or a baguette to shorten the wait. Note: while there are multiple steps to this recipe, this German meat fondue is broken down into workable categories to help you better plan for preparation and cooking. In a large saucepan, brown the cut surface of the onion without oil. Add the leeks, carrots, celeriac, bay leaf, peppercorns, and broth. Bring everything to a simmer and cook for at least 15 minutes. 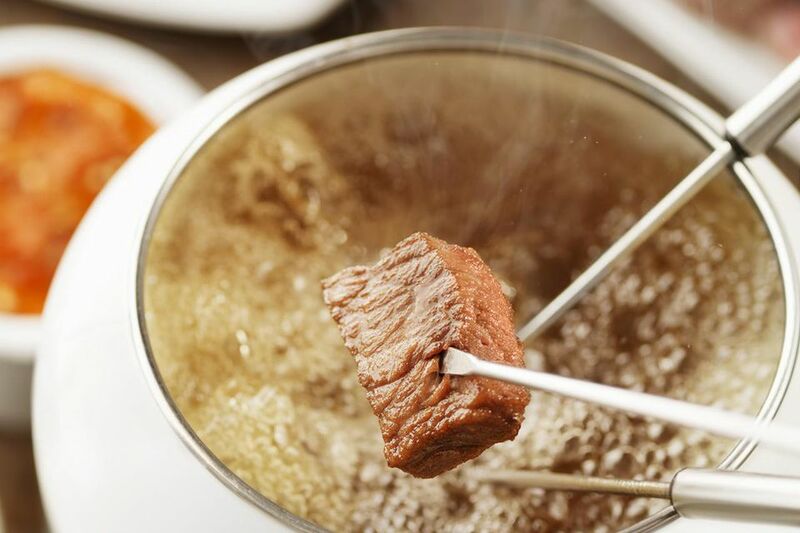 When it is time to eat, strain the broth into a fondue pot and place on the table over the heat source for your fondue. While the broth is simmering, cut the pork into bite-sized pieces. Mix the ground meat with the egg and breadcrumbs, salt, pepper, and paprika. Form into bite-sized meatballs and place in the refrigerator until serving time. Place cocktail sausage slices in a serving dish. Clean and separate the cauliflower into bite-sized chunks. Cut the zucchini into quarters, lengthwise, then into 1-inch pieces. Place in separate serving dishes. Keep everything covered and cool until the party begins. Chop about 1/4 cup chives into small rings and place in a bowl with the sour cream. Add salt, pepper, paprika, and optional lemon juice to taste. In a small bowl, mix together schmand or creme fraiche, chopped parsley, mustard, salt, and pepper to taste. When it is time to eat, place the fondue pot filled with broth on the warmer (rechaud) in the middle of the table. Each person should have his own fondue fork. Place the serving dishes with the food on the table and let everyone pass them and place some meat and vegetables on their plate. Each person places one or two pieces of food on a fondue fork and dips it in the simmering broth. After two or more minutes, the tidbits are done. They are removed from the fork to the plate and new tidbits are placed on the fondue fork. Each person adds a dollop of the sauces to his plate and dips his cooked food in them. Many different combinations are possible. Some people like to drink the broth after the food has finished cooking. One suggestion is to scramble two eggs and swirl them into the broth (like egg-drop soup) and then serve it hot to the guests.